Ataulfo mangos are also known as the Honey Mango or Manila Mango. These tropical fruits are simply delicious and they have a string-less flesh. Ataulfo mangos have one of the thinnest seeds of any mango. They are smaller than other varieties of mangos but they do have a lot of flesh for their size and they melt in your mouth like butter when you eat them. Ataulfo mangos have a bright yellow to orange flesh when ripe. This tropical delicacy is very low in saturated fat, cholesterol and sodium. They’re also a good source of dietary fiber and vitamin B6. An Ataulfo mango is a good source of vitamin A and vitamin C.
Select mangos that are yellow to orange in colour and not a light green. Look for mangos that are heavy for their size and yield slightly to gentle pressure. Mangoes do not need refrigeration and should be consumed within a day or two of purchase. Avoid mangoes that cut with anything but an orange to yellow interior. Many Ataulfo mangos get too cold in transport and their flesh turns black to gray which spoils them. Always remember to wash your fruit well before peeling and eating them. There is more than one way to peel a mango — start from the top down, unzipping the fruit almost as you would a banana. Or, use a knife to slice around the large central seed, as you would an avocado. Then divide the mango into two halves, and extract the seed, which can be lifted out from the flesh, with a little help from the knife. Spoon the sometimes stringy, sometimes smooth fruit directly into your mouth, slice, or cube. 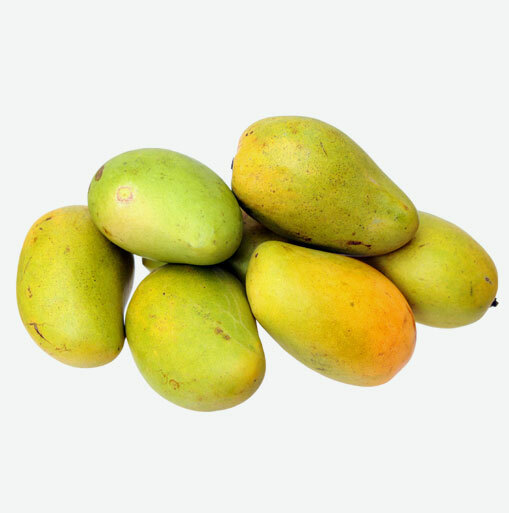 Cook mango into chutneys, add them to fruit salads, add them to smoothies, bake them into cakes or desserts.